On July 26th Crunchyroll showed off the first three episode of The Ancient Magus’ Bride in theaters across the country, as an installment of it’s Anime Movie Nights. The show has yet to air in Japan or in North America, so it was a rare peak at an anime months before it is due to actually come out. 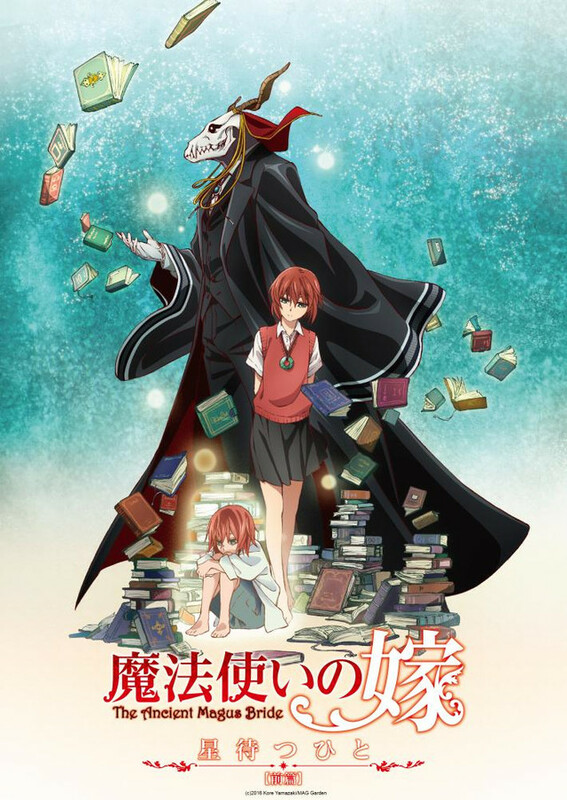 The Ancient Magus’ Bride follows Chise, a young girl who has lived a life of misfortune and out of desperation, sold herself into slavery. She is auctioned off to a bone faced mage named Elias Ainsworth, who aims to train her as his apprentice and one day marry her. He brings her from Japan to his English countryside residence, which she quickly begins to think of as home. Now, yes. Elias is in fact a bone faced mage and that seems to be his genuine appearance, having to use magic to appear human at all (a face that Chise complains, looks fake). And yes, Elias makes for an extremely weird romantic interest for Chise. His bone face never changes expression, except for during humorous moments where his face becomes simplistic and he smiles or sweats. Despite his frightening appearance, I was surprised by how quickly I was endeared to it. He can look menacing, or genuinely pleasant, just by his words or the context of the scene. It’s no surprise that Chise quickly becomes loyal to him. I haven’t seen the prequel or read the manga yet, so I went into this with only the trailer for the series. The show, from what we can tell from the first three episodes, avoids massive exposition dumps and instead prefers to world build slowly, when it makes sense for Chise to ask questions or be given information. It might be more useful for Chise to be sat down and taught everything all at once, but for the sake of narrative we should be glad that Elias and friends prefer to show rather than tell, and only tell when they must. Chise’s history itself isn’t explained up front; how she came to sell herself into slavery is dripped out in the first three episodes, and I am sure we still don’t have the full story. It does not shy away from the fact that her reasons are depressing and she’s been left severely damaged by whatever has happened. I’m glad the reasons are saved; enough is shown already that we can believe that she felt like it was her best option, but we can watch her heal as we learn more about why she was so desperate in the first place. I realize this may all be explained in the prequel miniseries, but I never felt confused about what had happened. The sadness of the first three episodes are juxtaposed directly with scenes of acceptance, happiness and peace, which works very well. It is emotionally engaging without becoming overwhelming. The show is heavy on whimsy; fairies come to chit chat, a letter Elias writes becomes a bird and flies away to deliver itself, cute spirits appear out of nowhere to cuddle—all the while harpsichord tingles to emphasize how magical it all is. Luckily, it avoids being too cheesy. The only times I felt like it was edging towards too much was one scene where Chise is babysitting infant dragons. It felt like it went on a bit too long, but again the juxtaposition came; after they fall asleep she has a conversation with their uncle about death. It’s all a bit too heavy to be appropriate for small children, but I can’t help but suspect this will be a good show to introduce to the tweens and teens in your life; cute and bubbly at times, but one that doesn’t sweep away how unfair life can be. The Ancient Magus’s Bride will being to air on October 7th, 2017 on Crunchyroll. Two of the three prequel episodes are already there, and the third one will be added on September 7, 2017. Megan “Spooky” Crittenden is a secluded writer who occasionally ventures from her home to give aid to traveling adventurers.